Targeting of high profile and international events by state-sponsored or other foreign adversaries, cyber criminals and issue motivated groups is a real and persistent threat. The information contained on government systems, whether classified or unclassified, is of strategic interest to cyber adversaries. Information gathered through cyber espionage can be used to gain an economic, diplomatic or political advantage. 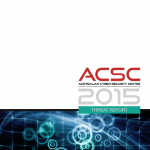 This is the first unclassified Australian Cyber Security Centre (ACSC) Threat Report. 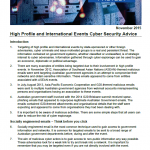 All ACSC partner agencies have contributed to provide information tailored for Australian organisations about the threats their networks face from cyber espionage, cyber attacks and cybercrime. It also contains mitigation and remediation information to assist organisations to prevent, and respond to, the threat. 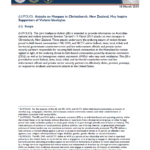 A collection of documents released publicly on July 11, 2012 in response to a Freedom of Information request from the Australian Department of the Prime Minister and Cabinet for material relating to WikiLeaks, Julian Assange and Bradley Manning. Telecommunications interception reform recognises that there are significant challenges facing intelligence and law enforcement agencies in accessing communications, particularly in keeping pace with rapid changes in the telecommunications environment. New, emerging and future technologies impact on the ability of these agencies to access communications to collect intelligence and effectively detect and prosecute crimes. The Australian Crime Commission’s Future of Organised Criminality in Australia 2020 assessment reveals that access to highly effective software, ciphers and other methodologies are increasingly being utilised by organised crime to impede detection by law enforcement. Lawful interception, therefore, is the most important tool in the investigation and prosecution of serious and organised and other technology‐enabled crime, and is vital to effectively collect security intelligence. Proposed reforms seek to allow those agencies to utilise modern technologies to maintain effective investigative techniques. Australian Federal Police Radiation and National Security in Australia Brief from October 2010. Townsville HSD reported a youth at Cleveland Detention Centre was displaying influenza like symptoms. The inmate was swabbed, isolated and commenced on Tamiflu, with ten further courses of Tamiflu supplied to the Centre’s nurse. Two further suspected cases have been swabbed, administered Tamiflu and isolated. On Tnesday, 04 Angnst 2009, Townsville HSD reported two positive cases of Pandemic (HlNl) 2009 at the facility.